When I last left off, I was explaining the ways to roll quilling paper into coils. Once you’ve mastered the art of making even coils, it’s time to take your quilling practice to the next level! While the circles formed from paper coils are perfectly lovely shapes on their own, the majority of quilling art comes from what you make of those coils. And so, for the next post in this series for quilling beginners, I’m focusing on how to make paper teardrops and other shapes. 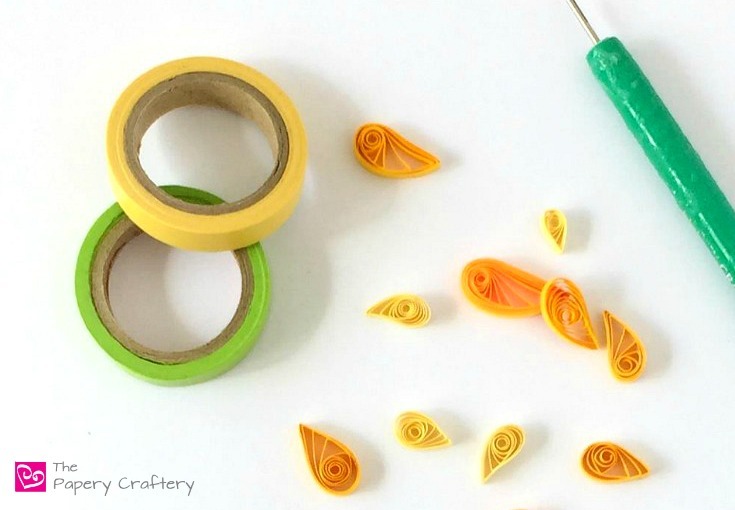 Changing paper coils into quilling shapes is as simple as pinching one or more sides. How many sides are pinched and how close together those sides are, is what determines the end result. Teardrops are a great place to begin working on quilling shapes, because they’re just a matter of gently squeezing one side of your loose coil. Some shapes have slight variations, too. Bend the point of your teardrop over one of your fingers, and you’ve made a shaped teardrop. Teardrops are perfect leaves or the starting point for these quilling paper snowflakes. Pinch two opposite ends of a loose coil at the same time to create a marquise. Just like in the case of the shaped teardrop, bending the marquise will make a new shape, as well! This time, use both hands to push and bend the points of your marquise into an “S” shape. I used both traditional marquise and shaped marquise when making my lily of the valley. Again, starting from a loose coil, make a pinch on both sides, but keep the bottom flat with your thumbs at the same time. Half circles were the shapes I used to form my white paper lilacs! This might take a few practice sessions, but you can do it! From a half circle, you can make a half moon. It’s as simple as bending the center of your moon over your thumb. After trying out some of these new shapes, start changing them up a little. Instead bending your peaks over your fingers, maybe use a wooden dowel or the end of your quilling tool. See how they look when you make your pinches a little off center of your coils. I bet you’ll soon be creating really unique, organic shapes! In the meantime, don’t forget to grab your copy of my quilling shape printable. After a little practice, move on to the next post all about making paper squares. And, for now, just keep quilling! So pretty. I used to craft a lot, but since I have had so many illnesses and surgeries, I haven’t done much. I hope you feel up to starting again one day real soon! Great, Lydia! Quilling is a fun craft for kids! these are so cute! Great tutorial. I love this idea, Meredith! I grew up scrapbooking and was always happy to learn new paper crafting techniques! Will definitely need to try this one out! That’s awesome! If you ever have any questions, I’m happy to help! Those are so pretty! They’d be great in an Easter card. That’s true! There are a lot of quilling paper artists who make beautiful cards!